The Greeks first arrived in South Omaha, Nebraska, in 1904, brought in as strikebreakers in the local meat-packing industry. That didn’t exactly endear them to the community, but they settled in, and by 1907, over 2,000 Greeks were reportedly living in the city. It wasn’t long before they built a church, dedicated to St. John the Baptist. On February 19, 1909, a Greek worker named John Masourides shot and killed a respected police officer. For many residents of South Omaha, this was the last straw: the Greeks had to go. Two days after the incident, a mass meeting was called to decide how to “rid the city of the undesirable Greeks.”At the close of the meeting, a mob descended on the Greek quarter. They attacked the Greeks, rioted, and destroyed property. The Greeks fled the city. The governor called in the National Guard. Order was restored, but the bigots of South Omaha had accomplished their goal: the Greeks were gone, and most of them would never return. 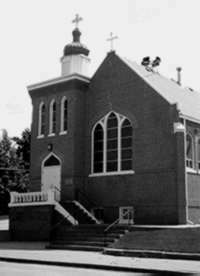 The mass exodus almost wiped out the parish of St. John the Baptist. As if all that wasn’t enough, a year later, a young Greek named Nicholas Jimikas was shot and killed by police. He is buried in an unmarked grave in Omaha’s Fort Lawn Cemetery. For more on the Omaha riots, see this US Congressional report from 1916, which gives a lot of details. Also, see a profile of St. John the Baptist church, written by Jim Golding and published in the December 1999 issue of the Greek Archdiocese’s Orthodox Observer. Interestingly, the history on the Omaha parish website makes literally no mention of the 1909 riots and their effects on the parish.